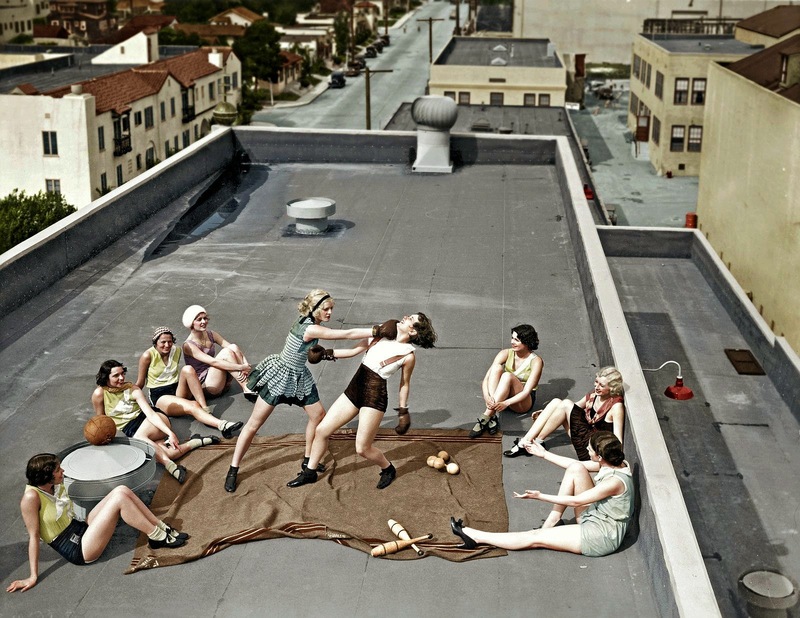 Women boxing on a roof, 1938. They are all wearing dance shoes so they are probably performers for a variety show. Since no one had decent air conditioning back then, practicing their acts outside on the roof was better than in a stuffy theater. Someone must have thought it’d make a good candid photo. The blonde girl is probably hitting her, but more of a stunt punch than a real one. Even if it is staged, it’s still historical. The theme of this picture is young, attractive women, dancers, exercising in the manner associated with men, which would have been an unusual thing for a woman to do in that time (especially the boxing obviously). The original caption reads: “Radio Pictures Chorus Girls“. 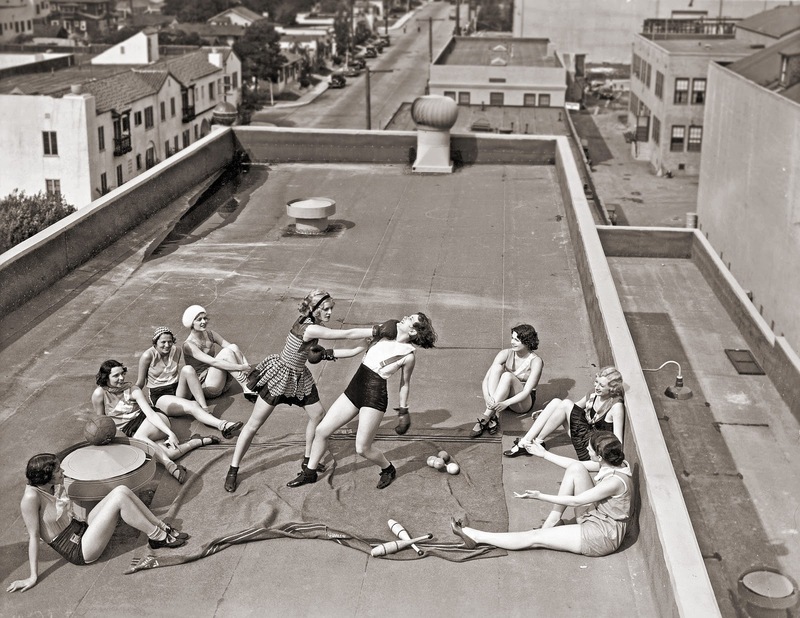 The photo was taken on the top of Ball Building, Paramount lot, Hollywood. Before that particular lot was the Paramount studio, it was the Desilu studio, and before that, it was RKO (Radio-Keith-Orpheum). RKO Radio Pictures Inc. was one of the Big Five studios of Hollywood’s Golden Age. They made some notable films in the 1930s and ’40s. During the 1930s RKO produced the well-known Fred Astaire-Ginger Rogers series of musicals and the early films of Katharine Hepburn. Among RKO’s other better-known films were King Kong (1933), one of the first monster films and Orson Welles’s Citizen Kane (1941), now considered a masterpiece in cinema techniques. In 1948 the businessman and producer Howard Hughes bought RKO, but his inattention and growing reclusiveness doomed the company; it ceased production in 1953. A chorus line is a substantial group of dancers who together perform synchronized routines, usually in musical theater. Sometimes, singing is also performed. Chorus line dancers in Broadway musicals and revues have been referred to by slang terms such as ponies, gypsies and twirlies. Ballet uses the term corps de ballet.